This post was created in partnership with Stella & Chewy’s, but all opinions are our own. Confession: I’m a total diet nerd. Maybe that’s a weird thing to say, but food is a big part of how we feel and how much energy we have, so I’m always looking for ways to try out new diets and see how they affect me. I’ve learned a lot about what kinds of foods nourish my body and make me feel good by testing out paleo diets, vegan diets, gluten-free diets, and dairy-free diets. Maybe because of that mindset, I’m also always looking for new foods that will help our dogs live their best lives. TBH, there’s very little I wouldn’t do to help Dave and Lizzie feel happy and healthy, so introducing different foods and seeing what sits well with them is a no-brainer. When Stella & Chewy’s approached us about trying out their food, I was really excited because I’d already heard about their great raw and baked dog food options—techniques that keep the good stuff (vitamins, minerals, and fatty acids) in the food instead of stripping it out during a high-heat cooking process. When it comes to dog food, I’m a Nervous Nellie. There have been way too many stories recently about toxic chemicals ending up in dog food and families losing their pets as a result. Stories like that keep me up at night, so I love that Stella & Chewy’s only uses very high-quality ingredients. All the proteins are grass-fed, wild-caught, or cage-free, and the fruit and vegetables are organic. Plus, you won’t find any gluten, artificial preservatives, hormones, or antibiotics in their meals. All their food is made in a kitchen in Wisconsin. And to keep it really safe, no ingredients are sourced from China. For the past year, Dave was about two pounds heavier than the vet said he should be. I tried cutting down on treats, reducing his serving sizes, and taking him on long walks back and forth across Brooklyn. But it seemed like no matter what I did or how many sad puppy eyes I got, nothing could get rid of those stubborn pounds. After all that, I was shocked when we went to the vet last week and discovered that the two pounds were magically gone. Eating only Stella & Chewy’s had kept him happy and high-energy, so I didn’t even realize he was losing weight. I hadn’t heard of the Prey Model before we switched to Stella & Chewy’s, but now I’m a big believer. Basically, the Prey Model replicates how dogs evolved eating in the wild. It gives them foods that their systems are built to digest, like raw meat. Now that Dave and Lizzie are eating the way they were meant to, their coats seem shinier and their breath is better. And, not to be gross, but potty-time seems a lot easier now, too. 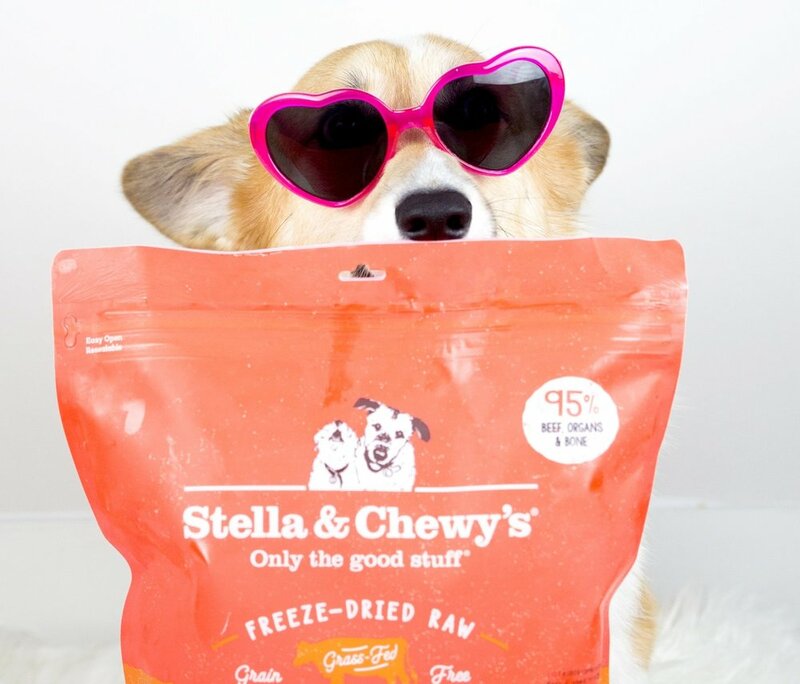 For every bag of Stella & Chewy’s food you purchase, they’ll donate a meal to an adult rescue pet in need. As of the time of writing this, they’ve donated 261,630 meals. The founder of Stella & Chewy’s is passionate about adult pet adoption and both her dogs (Stella and Chewy) were adopted as adults. The company partners with organizations like the Frosted Faces Foundation and NYC’s Second Chance Rescue to feed these pups until they find their forever homes. #5 Mealtime = Party Time! Are you interested in trying Stella & Chewy’s? Click here for $5 off your purchase. And let us know in the comments if you have questions for us!